Hello! It's time for a brand new Mojo Monday sketch (#224). Julee has created a really great sketch again this week! I had fun playing with this week's sketch. 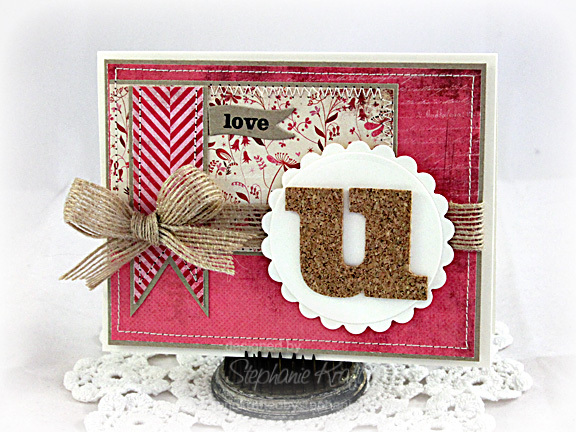 I pulled my cork sheets again and die cut the letter "u" from the A Cut Above Dies: I Heart U Die Set. I moved the small banner around on the sketch and stamped "love" from You and I. Accessories: A Cut Above Dies: I Heart U Die Set (Verve), Standard Circle and Scalloped Circle Nestabilities (Spellbinders), Mini Wavy Pennants Die-namics, Cork (My Favorite Things); Jute Twine Ribbon, Foam tape, Thread, Sewing machine. Fantastic card, Steph!! Love that ribbon!!! forgot to say how awesome that ribbon is! love it. This is great, Stephanie :) Love teh cork U and love flag/tag. So pretty Stephanie! Love that little flag/ribbon banner and the cork letter "u"! So creative as always! Thanks for the inspiration! Colors, design, banner..in fact I love everything about this card. Gorgeous! Such a lovely valentine card! Very pretty card, I love the beautiful DP and ribbon. Fabulous card Stephanie!!! LOVE the cork 'U'!